Cyril was born into a ringing family on 9th December 1934 at Saltwood, Kent, where he learned to ring in January 1949. He rang his first peal, Grandsire Triples, at Lyminge in Kent on January 28th 1950. His early ringing days were spent cycling around the Romney Marshes, ringing at the many sixes in that area; a background which no doubt inspired his love of six-bell ringing and of which he was to become the leading expert in later life. Attending Folkestone Grammar School he passed the Civil Service entrance examination and was destined for a career with H.M. Customs and Excise. However, National Service in the R.A.F. changed all that as he was selected as one of the elite few to undertake the Russian Language course at Bodmin, Cornwall, followed by a year’s service in Vienna with the Allied Control Commission for Austria. On discharge in 1955 he was appointed as a Civil Servant at Government Communications Headquarters in Cheltenham. He promptly joined the band at St Mary’s, the Parish Church (now known as Cheltenham Minster). On the retirement of William Dyer in 1959, Cyril was elected Tower Captain, a post he was to hold for nearly 40 years, working and inspiring St Mary’s to become an active and progressive 12 bell tower. During the late 1950s Cyril was introduced to a ringer from Kenwyn, Margery Birch, when acting as Best Man for Alan Carveth at Truro Cathedral. They married in 1960, forming one of the great ringing partnerships, becoming well known throughout the ringing fraternity, as Margery gave Cyril her strong and unstinting support throughout his many ringing enterprises. Cyril was active both at the local and national level through his association with the Gloucester and Bristol Diocesan Association (G&BDA) and the Central Council of Church Bell Ringers (CCCBR). He was Chairman of the Cheltenham Branch of the G&BDA 1962 – 1966, Honorary Treasurer 1963 – 1970, and Honorary Auditor 1973 – 1992. His association with the CCCBR was long and illustrious. 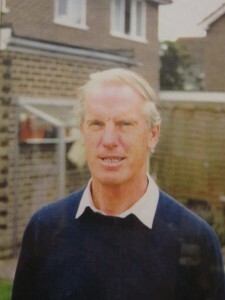 He first became a member in 1960, joining the Records Committee from 1966 – 1981. He was on the Standing Committee 1971-1972, the Computer Co-ordination Committee 1973 – 1984 and the Administration Committee 1972 – 1993. He was Secretary of the CCCBR 1971 – 1993. In the early 1980s he was involved in the formation of Ringing World Ltd as a limited Company, and at its inception in 1983, became the first Company Secretary. Cyril’s contribution to the Central Council was marked by making him a Life Member in 1986, and on his retirement in 1993 with the presentation of a copy of the Liberty Bell. During the 1960s, Cyril arranged a number of ringing tours, ‘Westward with Wratten’ and ‘Wrattens (W)ringers’ and in 1969 was a founder member of the ‘East meets West’ peal tour on which he was to be a regular for the next 25 years. As well as being a highly regarded and inspirational ringer, ringing a total of 1090 peals, of which he conducted 321 (103 on handbells, conducting 89), he was also known for writing numerous articles for The Ringing World on various topics such as Spliced Surprise Minor and the history of ringing. He made significant contributions to Volumes 2 and 3 of ‘Change Ringing – The History of an English Art’, and compiled ‘A collection of Surprise Compositions’ in 1964. Cyril was also a regular and popular speaker and tutor at many ringing courses. Besides ringing, Cyril and Margery enjoyed travel and were members of a local walking group which met for regular walks in the Cotswolds. Cyril died on October 2th 2004 after a cruel illness which robbed he and Margery of a well deserved and active retirement. His funeral was held at St. Mary’s Church, Cheltenham (now Cheltenham Minster) on November 2nd 2004.